The saying “isn’t the world a small place” is usually used when we’re talking about a coincidence, or a chance meeting with someone we know, far away from where we know them. But with today’s ability to travel, the world really does seem to be getting smaller. 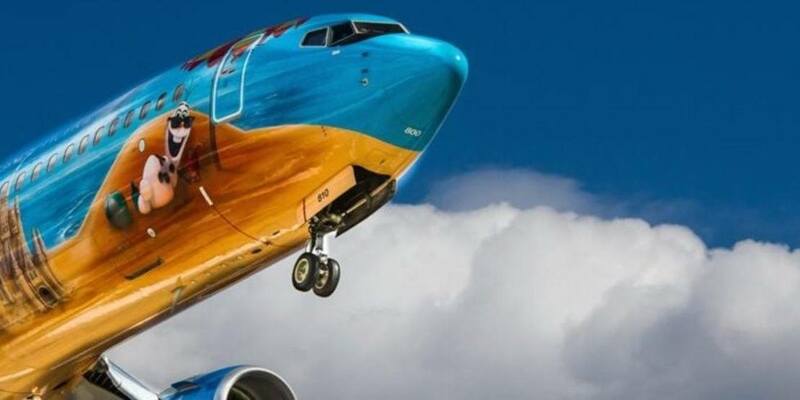 We can hop on a plane and be anywhere we choose within a matter of hours. So the same can be said for having a cosmetic procedure like a hair transplant. We don’t have to have it in the country we live in. We can choose to escape to sunnier climes, or somewhere with more beautiful scenery. Or, we can simply choose to ‘go on holiday’ and come back with an exciting new hairline in the making, once any swelling or scabbing has healed. But where do we go? Obviously, we need to do our homework. We need to make sure the clinic we choose in the country we decide on is registered with the relevant bodies such as the International Society of Hair Restoration Surgery, or ISHRS. We also need to make sure the surgeons are qualified and experienced, that the surgical support teams are also trained and the clinic itself is clean and hygienic. And although we don’t like to think about things going wrong, we do need to ensure the clinic offers aftercare and has a system in place in case things don’t go according to plan. It might feel a little nerve wracking, thinking about going abroad for a hair transplant. You might feel uncomfortable not being at home, or worried about a language barrier. But it doesn’t have to be this way. With enough research, and that includes reading independent reviews and listening to personal recommendations, you can put your mind at rest and enjoy your trip! A major thing we also need to think about is cost. How much will the whole procedure cost? Does it include flights and accommodation? What about transfers between the accommodation and the clinic? Is it a fixed price, or will there be any unexpected costs added on at the end? What about fluctuating exchange rates, will the agreed price change when I get there? Do I pay in my currency, or do I pay in the local currency? Well, we’re here to help. And because we want you to make an informed choice, we’ve looked into the average costs of hair transplants around the world and we’ve put them all together in one place. So, what else should you be looking out for…? What you want/need to have done can differ. For example, if you already have a fairly full head of hair and you just want your hairline filled in, then this is a simpler procedure than if you have quite a large area of male pattern baldness that you’d like to have treated. The latter doesn’t necessarily mean it’s more difficult to treat, just that it’s a more complex procedure. The more complex the procedure, the longer it takes, and this could impact on the cost. Some clinics, like ours, have a fixed fee per hair transplant, but some may base their fees on how many grafts you need. Most hair restoration clinics nowadays use the FUE, or Follicular Unit Extraction method of hair transplantation. FUE involves your surgeon removing follicular units from around the back of the scalp using a small punch tool. A follicular unit is a small piece of tissue that includes around four or five hair follicles and up to 20 individual hairs. The follicular unit is then transplanted into the front and sides of the scalp where your hair is naturally thinning. The old-fashioned method of hair transplantation is called the Follicular Unit Transfer, or FUT, method, sometimes called the strip harvest method. This involved a long, thin strip of scalp being removed from the back of the head, usually from ear to ear. The surgical team would then carefully remove individual hair follicles ready for transplantation. This method understandably causes more scarring than the FUE. 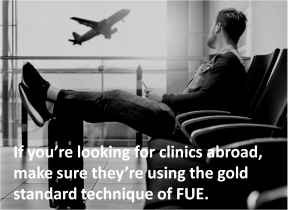 If you’re looking for clinics abroad, make sure they’re using the gold standard technique of FUE. If they’re not, it could mean that they’re not keeping up to date with the advances in hair restoration. When you’re researching having a hair transplant abroad, it’s likely that the first representation of the clinic, and the surgeon, is their website. Now, we’re not all web developers, designers and content writers, but if a clinic has gone out of their way to have a slick, modern website, then this is a good starting place. We’re not saying that if a clinic has a great website, then that means they’re a great clinic. Anyone can pay to have a website made and you must do your research into them. But if the clinic cares enough to have an up to date website, then they more than likely care enough about you and your hairline. A good place to check is their blog. If they have one that is regularly updated, then they’re actively looking to inspire and educate their patients and potential patients like you. A blog should be informative and not too ‘salesy’. It should be doing all it can to educate and inform its readers. Another thing to look out for is the surgeon’s credentials and ‘trust marker’ logos. If a clinic proudly displays the names and qualifications of their surgeons and surgical team and has logos such as that of the ISHRS on their homepage, then it’s a good sign. If you have to go digging for them, it’s probably not. Another good sign is the ability to have a free consultation, online or otherwise. Your instinct is normally right. If you don’t get a good vibe from the staff during a consultation, or the consultation process itself, then listen to your instinct. Avoid any clinic who seems more keen on taking your money than helping you look your best or answering your questions. Those alarm bells are ringing for a reason! If you’ve got this far in your research, well done! A hair transplant can be a big deal, emotionally, physically and financially. Does the clinic speak your language? Make sure that there are staff on hand that speak your mother tongue fluently. Talking about medical practices in broken sentences can end in tears! The website is a good test, if the language is clear and error-free, then they care about communication. Does the clinic have high hygiene standards? The country you’re visiting might have a different standard of cleanliness than you’re used to. Across the world we’re all different. But this doesn’t mean the clinic itself should be unsanitary. This one is difficult to check until you’re there, but online reviews and website images should give you a clearer idea. Is the aftercare and follow up included? The last thing you want is to be ushered out of the clinic without being told how to look after your scalp. You’ll usually be told how the clinic manages after care during your consultation. If in doubt, ask at this meeting, its your best chance of gauging that your surgeon has your best interests at heart. Best wishes, and if you’d like a free consultation with us, just get in touch! « Can a Hair Transplant Cause Cancer?